After a series of snow sculptures, perhaps now is the moment to look at some more lasting sculptures. 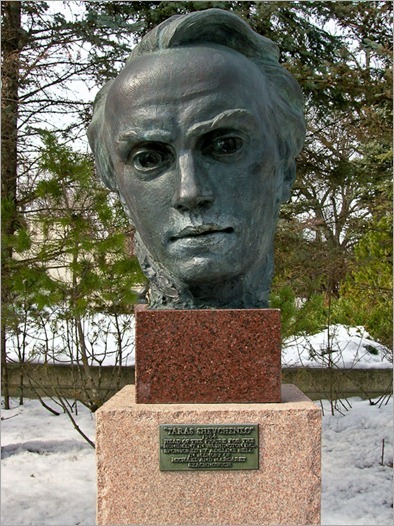 Winnipeg has been the home of world renowned sculptor Leo Mol. Leo Mol as he was known in Canada was born in 1915 as Leonid Molodozhanyn in Polonne, Ukraine. At that time Ukraine was still independent from the future Soviet Union, so we can drop the “The”. He studied sculpture at the Leningrad Academy of Arts from 1936 to 1940. When Germany invaded the Soviet Union in 1940 he fled to Germany. In 1945 he went to Holland and three years after that he and his wife Margareth moved to Winnipeg. 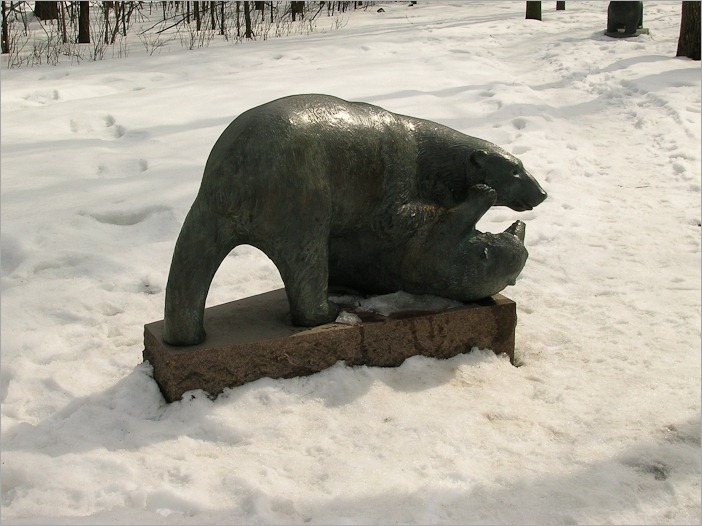 Here in Winnipeg the Leo Mol Sculpture Garden is located in the Assiniboine Park. The sculpture garden contains more than 300 works of art by Leo Mol. More than 200 were donated to the city by Mr Mol himself. The rest comes from private collectors and donators. Sculptures of three different popes stand in the Vatican, in Winnipeg we can admire smaller versions of these sculptures. 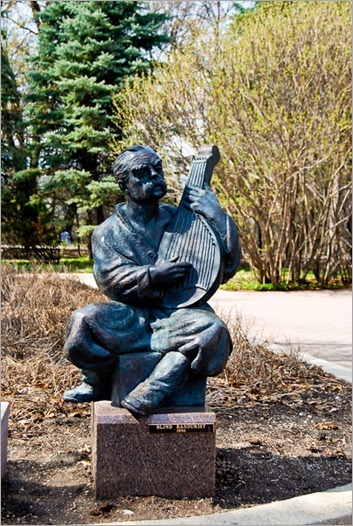 One of his famous sculptures is of Ukraine’s poet Taras Shevchenko. In the Assiniboine Park we can admire the head of the poet’s sculpture, for the rest you’ll have to go to Washington DC, USA. So, what else can we find in the Leo Mol sculpture garden? On the other hand, a stamp hardly gives you the chance to appreciate the size of things, so I put myself next to the real sculpture. 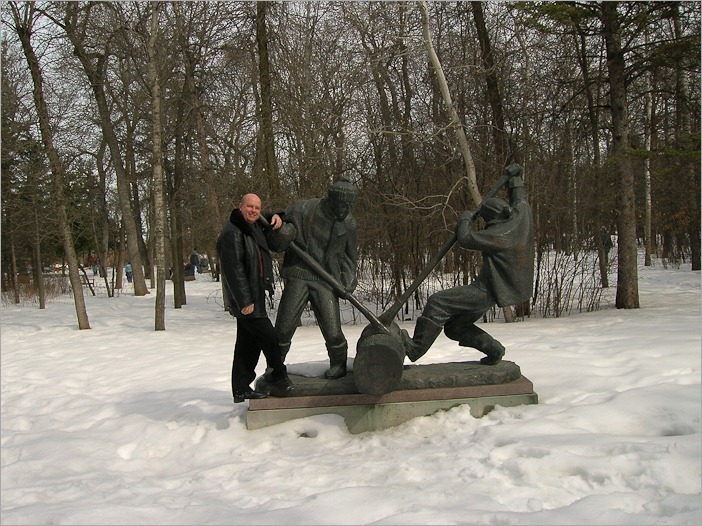 The sculpture is bigger than me, and the lumberjacks are larger than life! The bears, the deer and other figures are all around you. Even on the postage stamp they are in the background, you’ll just have to look closely. 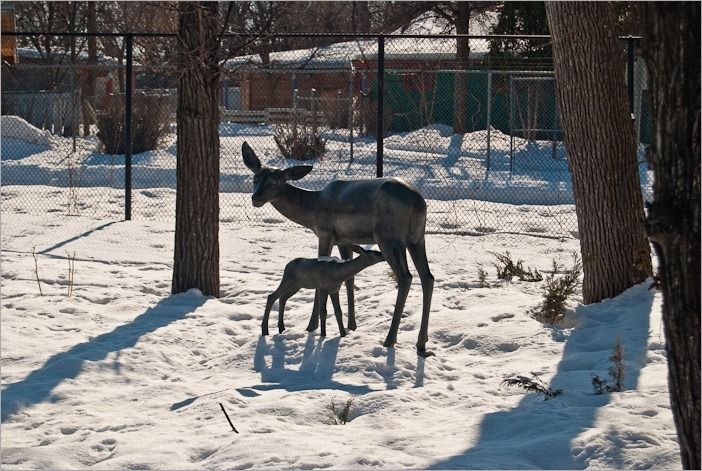 The sculptures are so real, that if the picture were not so sharp, it could have been mistaken for real deer. The bears are a little more obvious, but also great to look at and even to touch. Many of the statues have “golden” patches from all the rubbing. Leo Mol never forgot about his past and the travels he had made. His short stay in The Hague in Holland from 1945 to 1948 was certainly for study, but he also must have enjoyed the time. 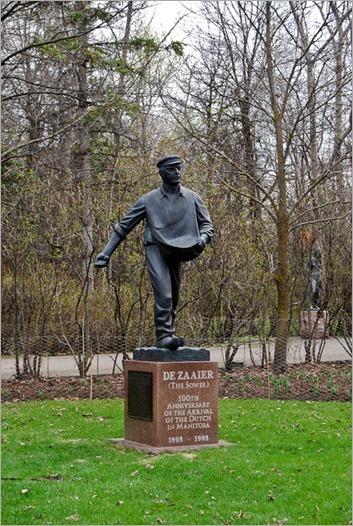 Enough to make a statue of a Dutch sower, named “De Zaaier”. The statue celebrates the 100th anniversary of the Dutch community in Manitoba. Sowing really still was done by hand in 1893 and even much until the early 1930’s. At least in Holland. 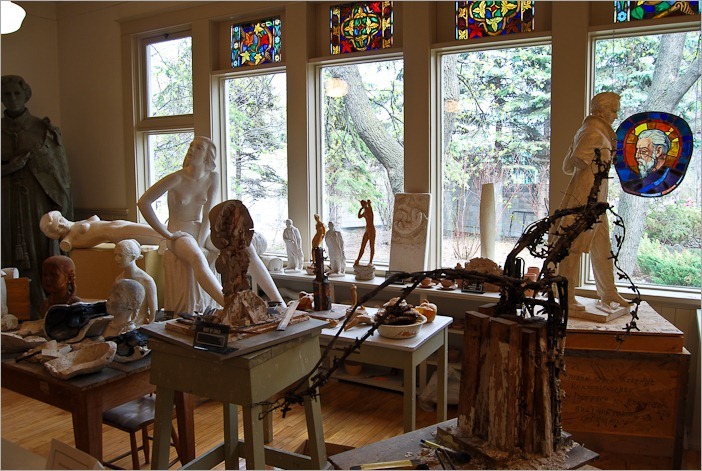 Another interesting part in the sculpture garden is the working atelier of Dr Mol. For some time he worked in a small building that formerly was a one-room school in Birds Hill. In the beginning of the 1960’s the school was menaced with destruction/removal. Mr Mol then decided that they could take it apart and restore it elsewhere. This remained his studio for a long time. The school building can be visited in summertime, during winter it’s closed. Of course his Ukrainian young years were not forgotten and some of the attractions in the Ukrainian villages were the travelling singers. They were called Bandurists and travelled from village to village. The sculpture of the “Blind Bandurist” is so real that you are simply looking for the small glass of samogon (homemade vodka) and the pickles next to the musician. Dr Leo Mol died on July 4th, 2009 in the Taché Hospital at the age of 94.